High end brands, they make you feel like a million dollars and they cause your wallet to want to jump out of your purse whenever you walk into a beauty shop. I tend to use mostly drugstore items, but I have to confess... There are times I become a woos and I splurge. Last summer I was walking through the beauty alley and I saw that some of the products of Clarins were on sale. Yes, I justified it because it was on sale. 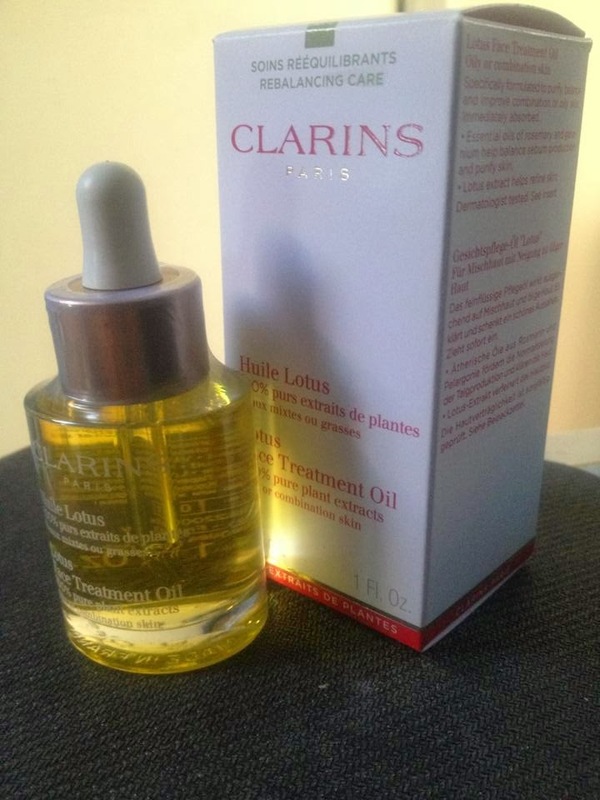 I got myself the Clarins Lotus Face Treatment Oil. It's a yellow oil that you put on your face to treat your skin. This is towards those with oily or combination skin. You may be thinking: Lily, I already have enough oils on my face going on and now you're saying to slather on some more oil? Really?!? Yes. I'm telling you to treat your oily faces with oil. as crazy as it may sound, this actually works. After cleansing my face I put 2 drops in my hands, rub it and press it into my skin. If you massage it well, this will sink into your skin. Just give it some time for the oil to do its work. I do have to mention the rather medicinal scent to the product. For those who don't like heavily fragrances, this may not be your cup of tea. When massages into the skin you can still smell a subtle hint of the medicine. I have been using this for a couple of months now, and I have noticed less blemishes and less oily skin. Since you only need a few drops of this, I'm sure this bottle will last me quite a while. I spent 24€ on this bottle, with discount. Normally I won't spend that much money on something I've never tried before, but ... once in a while won't hurt, right? Let me know if you've tried this as well. What do you think about this oil fighter?